Specially crafted from soy, yogurt and honey, all-natural Almased does not contain any artificial flavors, fillers, added sugars or preservatives. Almased uses an ingenious, clinically tested formula that has been proven safe and effective for nearly anybody, including people with diabetes. It is also an ideal protein supplement for athletes, vegetarians and the elderly. Additionally, Almased can be consumed as a wellness drink. It boosts the immune system, improves energy levels and supports restful sleep and nightly cell renewal. The positive effects of Almased have been documented in various clinical studies and are repeatedly confirmed by consumers. Backed by 20 years of experience and research. Suitable for diabetics that are overweight. Almased neutralizes sugars in the blood, so that there are no insulin spikes. A high amount of insulin stimulates the Leptin hormone, which is responsible for fat storage. When it goes up (spikes), it stimulates the body to store fat. When you remove insulin spikes and supply your body all the nutrition it needs, your body accesses its fat reserves for energy. If you have tried other diets without success, you’re not alone. Other diets simply do not make sense to your body. Your body has learned to store more and more fat, setting up a biological scenario that makes it impossible to achieve the weight loss you desire…until you discover the Almased solution. The healthy prescription for living explained in the Almased Wellness Concept explains step-by-step how the body utilizes food, why our bodies react poorly to today’s diets, and how to teach our bodies to become lean and stay that way. This scientifically developed, stimulant-free diet teaches the body to “think thin,?invigorating the metabolism and decreasing long-term fat deposits without hunger and without the yo-yo effect. The Almased?Synergy Diet Program starts with a period of liquid nourishment to cleanse the body in preparation for a healthy meal plan and moderate exercise program. This revolutionary diet is proven to end the frustration of repeated failure, bringing a healthy, slim body within anyone’s reach. To supplement you diet, mix 8 tablespoons (48 g) of the powder with 10-12 oz of cold liquid, such as bottled water, low-fat or skim milk or unsweetened juice. Customize you Almased drink by blending 8 tablespoons (48 g) with your favorite ingredients, such as fruits and cinnamon for a great tasting smoothie. Also great in cottage cheese or yogurt. 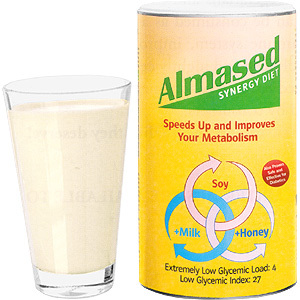 Almased Synergy Multi-Protein Powder should be made fresh and consumed immediately after mixing. Other Ingredients: Soy Protein Isolate, Honey, Skim Milk Yogurt Powder, Vitamin C, Niacin, Vitamin E, Zink Oxide, Vitamin B2, Vitamin B6, Vitamin B1, Vitamin A, Copper Gluconate, Folic Acid, Manganese Sulfate, Sodium Selenite, Potassium Iodide, Biotin, Vitamin D3, Vitamin B12. The convincing results of a clinical, university study with Almased?have now been published in the renowned International Journal of Obesity. In this 6-month study, overwieght men and women in the Almased?groups lost on average 42% more weight than participants on a low-fat diet. Moreover the participants lost the fat around the waist, stomach and hips, but retained valuable muscle mass and had more energy. Like It "Good For Diabetics Trying lose weight"
This amazing product is made in Germany. It is sweetened with a little honey even Diabetics can take it. The low glycemic index gives no cravings after using it. Love It "It's Part of My Daily Diet Now"
Love the product & introduced few friends to try it out. I've been using Almased for 6 weeks now and aside from the weight loss, the feeling of well being is enough to keep using it as part of my daily diet. Most diets involve a reduction of calories. Usually drastic calorie reduction means your body doesn’t receive all the amino acids it needs to make the metabolism run normally. With the Almased all the amino acids the body needs are provided and your body is never deprived. The right amount and balance of amino acids means your body won’t send out hunger or starvation signals and conserve rather than burn fat. Question: What's so special about the Almased Synergy Diet Program? Answer: The Almased Synergy Diet Program allows the body to lose unwanted fat with a unique formula of soy protein, skim milk yogurt powder and honey enzymes. Almased contains all the essential amino acids and is not altered in any way with stimulants, chemical additives or artificial ingredients. 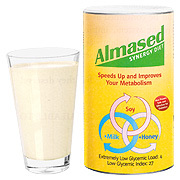 With the Almased Synergy Diet your body receives more protein than other similar products on the market today. You lose unwanted fat and keep it off even when the Almased Synergy Diet is complete. No other program on the market today can help you lose weight and keep it off the way the Almased Synergy Diet can. Question: Why do you burn so much fat on the Almased Synergy Diet Program? Answer: Most people require about 2,000 calories a day. While on this diet, the body is provided with a daily ration of about 1,300 calories, creating a deficit of 700 calories. Since these calories are suddenly not available, the body takes them out of its fat reserves. At the same time, the body continues to be supported by Almased’s high quality protein and ingredients so muscle mass is protected during the program. Therefore, it’s not surprising that 2-3 pounds of fat will be lost per week. Question: Will I feel hungry on the Almased Synergy Diet? Answer: No, Almased is nutrient dense food, which nourishes the body and helps to create a balance within. This balance is what keeps us from becoming hungry and helps to sustain energy. Question: If I start the Almased Synergy Diet, when can I see results? Answer: Immediately! If you stay committed to the program, which would include watching the calories you consume for your regular meals (under 500 calories) and exercising 2-3 times a week, the pounds will melt away. Remember you should take your measurements when you start the program and your body fat percentage because your weight on the scale only tells you part of your success. This does not mean you have to exercise Almased but it will increase overall weight loss. Question: Has Almased and it’s claims for weight loss been researched? Answer: Yes, unlike many other diet products that use the research for the ingredients in their product, Almased spends millions of dollars to have independent, FDA approved research done using the exact formula you can purchase on the shelf. Before I begin the Almased Synergy Diet - What you need to know. Question: Why do I need proteins? Answer: Proteins are the basic building blocks of every cell in your body. In order to build, repair, or rebuild muscles your body need amino acids that only come from proteins. Question: Do people who are lactose intolerant have trouble taking Almased? Answer: No, Almased has very minimal (trace) amounts of lactose and because of the special fermentation process, most lactose sensitive people do not have problems. Question: Does Almased contain any drugs, added caffeine’s, stimulants, or appetite suppressants? Answer: No, Almased is 100% all-natural and has only 3 ingredients, soy, skim milk yogurt powder and honey enzymes. There is nothing else added. Question: Can I work during this diet or must I curb my activities? Answer: While on the Almased Synergy Diet you will be fully capable of handling your normal workload and daily activities. Exercise is not necessary to have success on the program but can accelerate your weight loss, and is recommended. Question: Why do I have to consume 8-10 glasses of water? Answer: About 60% of our bodies are water, and we must constantly replenish them. Water is needed to maintain a healthy body. Most people do not consume enough water and when this happens our bodies will draw it from the bloodstream. Our blood then becomes thicker triggering added stress on the heart. When you feel thirsty this is a sign you are dehydrated. Decreased brain performance, dizziness, and faintness are all signs that your body is deficient in its water supply. Even when you are not on the Almased Synergy Diet program drink 8-10 glasses of water is recommended. Question: What does Almased taste like? Answer: Almased has a mild, all-natural vanilla-nut flavor. The taste can be altered very easily by what you mix it with. Add a dash of cinnamon or vanilla extract to spice up the taste. 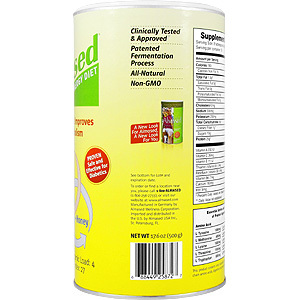 Almased is formulated from all-natural ingredients and contains no sugar, artificial sweeteners or flavorings. The consumption of sugar has risen by 1600% over the last 90 years. The average American’s sugar consumption is 170 pounds a year. Sugar is one of the contributing factors to the U.S. obesity problem today. Watching sugar consumption during weight loss greatly enhance your weight loss success. Question: Can I flavor the Almased diet meal? Answer: Yes, you can add any flavor you like, but keep in mind the more calories you add through flavoring the more the weight loss will be slowed down. Some flavoring we’d recommend are cinnamon or vanilla extract. Question: Can I mix Almased with anything besides water? Answer: Yes, you can mix Almased with skim milk, juice or other cold beverage items, but remember the more calories you add the slower the weight loss will be. Keep in mind also Almased is sugar free, if you mix it with anything other than water be sure to see how much sugar is in the mix and try to keep it to a minimum. Question: Can I mix Almased in hot coffee or herbal tea? Answer: No, hot liquids will destroy the enzymes essential to convert protein into amino acids. If you’d like to use cold coffee or tea we recommend you use the decaffeinated kind. Question: Can I freeze or heat Almased? Answer: No, an extreme temperature change, whether higher or lower, can change the proteins and reduce their solubility, digestibility, and bioavailability. Question: Can I blend Almased? Answer: Yes, blending will not cause any damage to the proteins. After you’ve achieved your target weight using Almased in a fruit smoothie is a great way to have a high protein meal replacement or snack. Question: Can I pre-mix Almased and let it sit for a while? Answer: No, a liquid protein is a very fertile environment for bacteria. It is best to drink Almased within 5-10 minutes of making the shake. Mix Almased as needed and never let it sit overnight. Question: How do I store the Almased? Answer: Store in a dry cool place. If you live in a very hot and humid climate and your house is not air-conditioned, you should refrigerate the opened can. How do we blast those free radicals? Answer: Free–radicals are unbalanced atoms that cause damage to the human body that can lead to aging and degenerate diseases (i.e. heart disease, osteoporosis, diabetes). Answer: Anti-oxidants are the human bodies natural defense to free-radicals. Antioxidants can safely interact with free radicals and terminate damage that can be caused to the body when free-radicals are left unchecked. Question: Can I continue to take a multi-vitamin while on the Almased Synergy Diet program? Answer: Yes, Almased recommends a multi-vitamin be taken while on the program as well as on an ongoing basis. Vitamins and minerals are the basic foundation to optimal health. A multi-vitamin is a convenient and easy way to take all the necessary nutrients in one supplement, in order to prevent deficiencies. 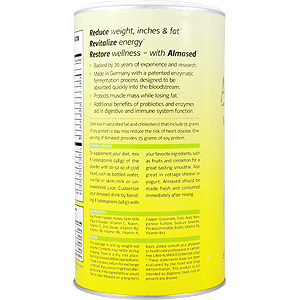 Almased offers a liquid multi-vitamin-mineral for sale in addition to the Almased Synergy Diet program kit. Question: What kind of Multi-Vitamin should I take? Answer: A liquid, powder, or soft gelatin capsule multi-vitamin are the easiest for the body to absorb. Tablets however are difficult for the body to digest and absorb. When purchasing a vitamin if it is a liquid keep in mind that it must be low in sugar and carbohydrates, as many companies will add sugars to better the taste. Almased offers a very unique and patented liquid multi-vitamin-mineral complete with over 90 trace minerals for sale in addition to the Almased Synergy Diet. Question: Can I skip drinking the vegetable broth? Answer: Yes, if you are taking the multi-vitamin or do not want to drink the broth you can. The vegetable broth is very important for its vitamins and antioxidants that will fight the free radicals your body will produce while detoxification occurs, but it is not necessary for your success. Question: Can I substitute regular vegetable bouillon cubes for the no-sodium vegetable bouillon included in the diet? Answer: Yes, but it is recommended that you try to eliminate sodium (salt) while on the Almased Synergy Diet to aid in overall weight loss. Question: Can you have chicken or beef bouillon while on the Almased Synergy Diet? Answer: No, you should consume vegetable broth only. Meat broths contain fat and carbohydrates and will slow down your weight loss. What can I expect on the Almased Synergy Diet? Question: What side effects are normal when on the Almased Synergy Diet? Answer: In the first 2 days you might have a headache, this is attributed to the large amount of toxins that are being dropped into the bloodstream for cleansing from the body. This is normal. Drinking more water and taking Vitamin C, E and other antioxidants (e.g. green tea) will help alleviate your headache. Some people notice clearer skin, higher energy, clarity of the mind, relaxation, better sleep, rejuvenation of the body, enhanced senses, and improved stress levels. Question: I am losing so much weight on the Almased Synergy Diet, how long can I do it? Answer: One can stay on the Almased Synergy Diet until they reach their IDEAL or TARGET weight. Once this weight is achieved, slowly break the diet by incorporating well-balanced meals in place of each Almased diet meals. Remember, stay the course and keep eating healthy as described in the diet program. Almased & Exercise- Do I have to go to the gym? Question: Will I still lose weight even if I don’t exercise? Answer: Yes, but light to moderate exercise is important in lowering stress, improving strength & flexibility, utilizing insulin better, controlling weight, burning more calories, and increasing lean muscle mass. Exercise is encouraged but not necessary when on the Almased Synergy Diet. Question: Why should I exercise? Answer: Physical activity is essential in maintaining total health for the body. A physically fit and healthy body is the result of exercise and good nutrition. A few additional benefits of exercise are; improved sleep, healthier body composition, prevention of disease and chronic illnesses, and increased energy. Does this mean I have to go the gym everyday for 1 or more hours? No, just 30 minutes of light activity 2-3 times a week is a great way to start! Question: Why is it a good idea to take Almased BEFORE my workout? Answer: Because of Almased high quality protein and amino acids you will see increased stamina and endurance during your work-out. Question: Why is it a good idea to take Almased AFTER my workout? Answer: Exercise depletes your body, Almased with its complete proteins is a great post workout meal for anyone needing to replenish with the proper nutrients for muscular health. Question: Will I get big muscles by using Almased? Answer: No, you can however achieve a lean muscular body by working out moderately and supplementing your diet with Almased. Keep in mind also that on the Almased Synergy Diet as you lose fat and retain lean muscle mass. You will naturally become more “muscular?in appearance. Healthy Meals - Eating right during and after the program? Question: What does a healthy meal consist of? Answer: A healthy meal consists of lean meat (these are chicken, fish or tofu), raw or cooked vegetables, and whole grains. You should not consume pasta, refined sugars, white rice, white breads, candy, cakes, or any overly processed, fried or prepared foods. These contain excessive artificial ingredients and preservatives your body does not need. EXAMPLE: 2-3 ounces (size of your palm) of skinless chicken, 1-2 cups of salad with a little oil and vinegar, or green vegetables, and 1 cup of brown rice, or sweet potato. Question: What are lean meats? Answer: Lean meats are usually white and consist of chicken or turkey without the skin, fish (salmon, tuna, halibut, etc. ), and shellfish - yet limit your amount to no more than 6 ounces a day and 2-3 ounces per serving. Pork is not considered a white meat, as the leanest cuts still have over 60% fat! Lean meats are what keep your blood cholesterol level low, lower the risk of coronary heart disease, and reduce the risk of colon cancer. Question: Can I chew sugar-free gum? Answer: No, the chewing motion activates saliva and enzymes that will make you hungry. Question: Can I have sugar/carb drinks, diet soda, wine or beer while on the Almased Synergy Diet? Answer: No, sugar and carbohydrates will slow down your weight loss and both sugar and caffeine will stimulate hunger pangs. Question: Can I drink coffee during the Almased Synergy Diet? Answer: Yes, but try to limit yourself. Caffeine is known to raise the hormone cortosol that can block fat burning. Consume black or green tea or decaffeinated coffee for best results. 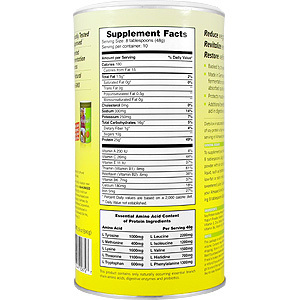 Question: Can I use an artificial sweetener while using the Almased Synergy Diet? Answer: Yes, but many artificial sweeteners have ingredients that are not good for the body. Try to limit consumption of artificial sweeteners or try Stevia a natural sweetener. I reached my goal - Now what should I expect? Question: After reaching my goal using the Almased Synergy Diet, must I spend the rest of my life eating strictly low-calorie meals? Answer: No, when you lose weight on the Almased Synergy Diet you lose fat and retain muscle mass which means you don’t have to worry about yo-yo dieting. You should eat sensibly and employ some of the advise given during the diet phases of this program to prevent from going back to old habits. You can also use Almased as a meal replacement and weight management tool after you reach your goal. A good way to do this is to replace a meal or two when you’re going to have a large dinner or need to skip a meal. Mix a drink with Almased (3-4 teaspoons) 30 minutes before you go out to eat. You won’t be as hungry and will eat less.Example: No time to cook a healthy breakfast or lunch? Instead of eating fast food or a high carbohydrate, high sugar meal consider an Almased shake or smoothie. Just add Almased to your favorite smoothie recipe. Question: Will I gain the weight back when I go off Almased? Answer: No. In studies conducted people who used Almased kept there weight off even after 6 months of not consuming Almased. However, it all depends on you. Almased is the beginning of a lifestyle change, and it was this change that helped you achieve the weight loss. If you go back to the same lifestyle and poor eating habits that made you gain weight to begin with, inevitable the weight will return. The secret to sustained weight loss is now yours. Adopt these new habits and continue to be the thinner you! Question: I want to continue to use the Almased Vital Nourishment but have run out of product. Do I have to purchase another diet kit? Answer: You can but you don’t have to. The Almased Vital Nourishment is also sold separately. Just visit our website for buy it at a discount price. Almased Vital Nourishment is shipped in a discrete, unmarked package. Orders are processed immediately and usually take about 3 to 5 working days to be received. We do ask that you try it for 2 to 3 weeks to feel the full effects. Any information received is used only for order processing and shipping purposes. Your information, such as e-mail address, will never be disclosed to a third party.